On occasional post, about music, of all things. Music. Who’d have thought it? Enough of comparing vinyl reissues, all that commercial competitive chest-beating stuff, lets get “musical” and what could be more musical than to compare… musicians . The subject of this post is jazz saxophone pairings, a setting which allows attentive listeners to compare and contrast the way jazz is played, how two similar musicians make different noises and make different choices in the same open setting. You may decide one of the two is better than the other, that’s your prerogative. Modern jazz is the home of improvisation, and the showcase of the improviser is the solo, expanding the melody and exploring the harmonic possibilities, “conversing” with the other musicians, and demonstrating the technical fluency and quick-thinking of a master of their instrument. The duet Two people playing a similar instrument sequentially in a small group setting is something different. Despite their common influences, every musician’s voice is unique. Art Pepper’s alto is immediately recognisable from Mclean, Konitz, and Lou Donaldson. The same instrument, but different voices. So what caught my interest when listening to some recordings recently was where the front line includes two soloists with the same instrument. The tune is the same, the instrument is the same, the opportunities are the same, only the intonation and compositional imaginations differ. The interest in the duet two similar instruments played sequentially in a small group setting for the attentive listener is therefore slightly different from the conventional quartet or quintet outing: follow which player is which through their different voices, their different approaches, and ultimately, the successful marriage of the solos rather than the contest to prove who can play better and faster (though there is a place for that too). It’s sort of competitive jazz artistry, where I am sure human nature dictates a little “competition” pushes higher endeavour, to the greater good of all. So I give you by way of an experiment, three separate pairings on vinyl, you could say a triple double. 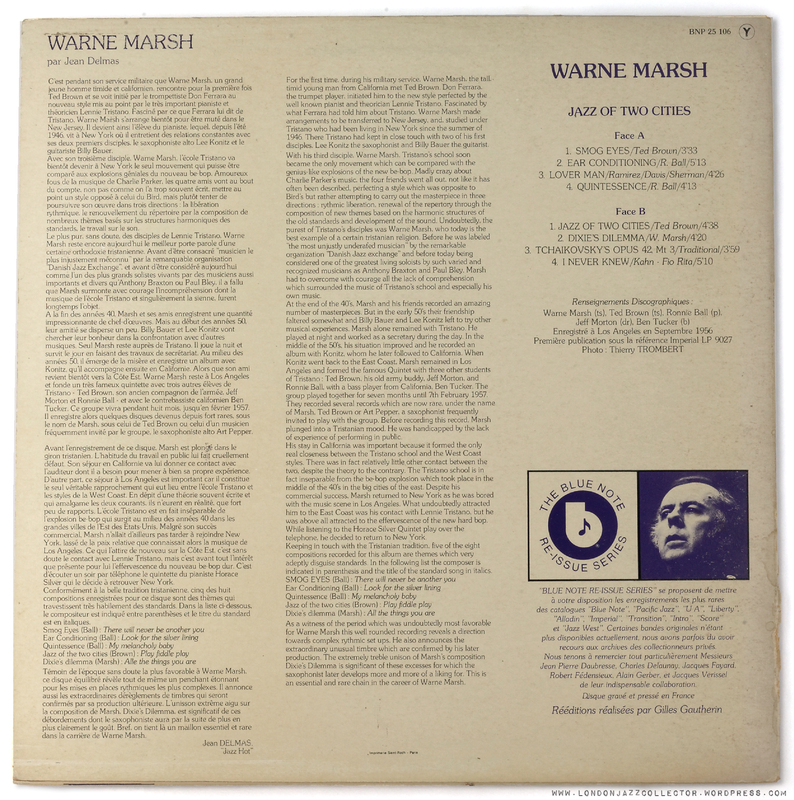 Controversial Stereo Edition: originally issued in mono, a heavily edited stereo version with the new title The Winds of Marsh was released by Imperial. 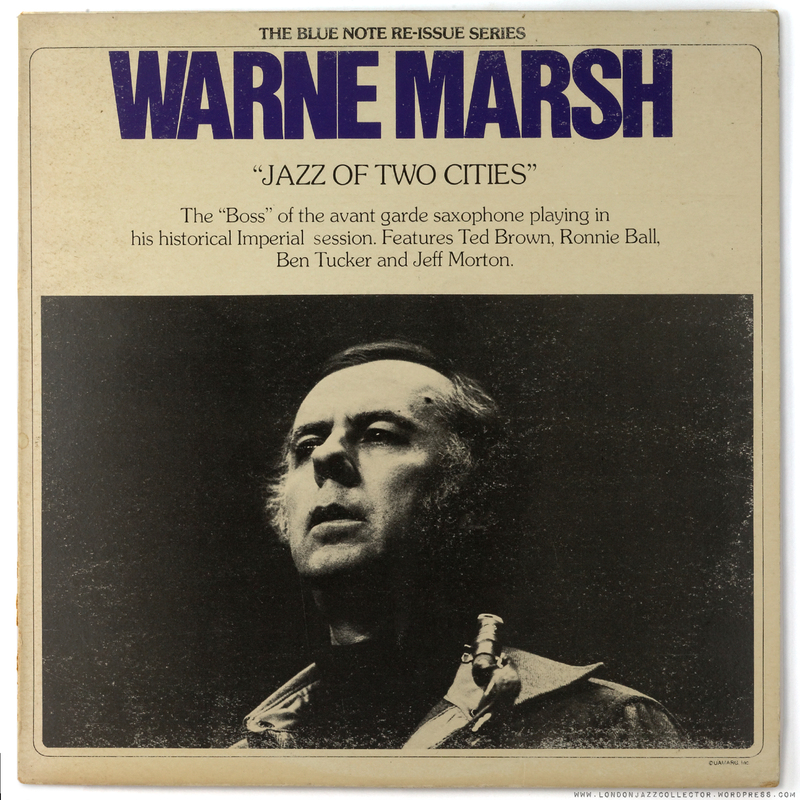 It featured several solos spliced from different takes, without Marsh’s permission, and which he angrily denounced to be a “bootleg”. The “one-fer” album pitch of Marsh as “”Boss” of the avant-garde saxophone” suggests something quite difficult, not so, this is pure West Coast sunshine: a classic album of Tristano-school cool jazz. Happy tunes, bright forward piano with more attack than mere accompaniment, a tight swing-time bass and drums, graced with extended weaving saxophone lines. The tenor tandem of Marsh and Ted Brown leaves your ears scanning for the handover with subtly different voice and phrasing, as they ride the tenor’s upper register, graceful and melodic in duet and solo. Vinyl: BNP 25.106 (French press, United Artists early ’70s). Blue Note Two-fer lookalike that is only a one-fer. Nothing “Blue Note” about it, merely licensed for release by United Artists on their Blue Note imprint from whoever held the rights to the Imperial recording, remastered and pressed in France. Whilst the two-fer Blue Note Reissue series can be sonically superb where sourced from van Gelder engineered original Blue Note tapes, their reissue of other studio recordings can be a trifle lack-lustre. The French reissue producers of this pressing were either working with a weak n-th generation copy tape, or didn’t have the skills to produce top transfer, as the dynamics are somewhat lacking, however the music is unquestionably top rate. Marsh and Brown: where are they now? 2. CHARLIE ROUSE AND PAUL QUINICHETTE: TWO “BIG” TENORS. Sax duels, rather than duets, were big in the ’50s and ’60s: Tenor Madness, Alto Summit and the like, but here on this slow blues the duet is conversational, honouring the blues tradition with elegant phrasing and sensitive handovers. Freddie Green adds just a touch of rhythmic spritz strumming guitar chords lightly without shipping the ensemble to The Loop. It’s jazz sensibility, not blues. 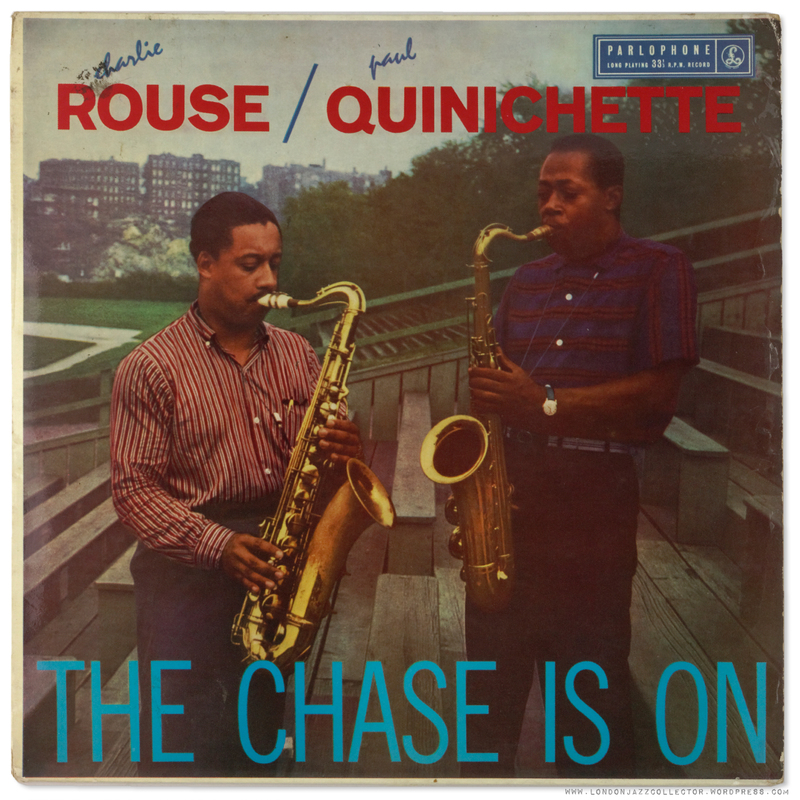 Rouse has the more full-bodied tone similar to Dexter Gordon, while Paul Quinichette’s breathy style earned him the soubriquet “Vice Prez” to Lester Young. Listen through, isn’t this just gorgeous? Languid, liquid, sonorous, heartfelt. Vinyl: Parlophone PMC 1090 – EMI pressing. Quinichette and Rouse: Where are they now? Paul Quinichette died May 25, 1983, Charlie Rouse died November 30, 1988 age 64, leaving behind ten solid years with Monk’s quartet. Both multi-instrumentalists, McIntyre’s approach is similarly exploratory to Dolphy’s, although tone was softer with less ferocious in attack. Heard side by side you realise how much so. McIntyre died in 2001 at the age of 69, equivalent to old age and of natural causes. Dolphy died on June 29, 1964 in a diabetic coma, however his musical contribution and recorded legacy rendered him musically immortal. Hope that was interesting. New ideas and suggestions for future posts always welcome, as long as they don’t involve any more audiophile reissues! This entry was posted in Blue Note, Charlie Rouse, Eric Dolphy, Esquire, Ken McIntyre, Parlophone, Paul Quinichette, Warne Marsh and tagged Bethlehem, Blue Note, Charlie Rouse, Eric Dolphy, Esquire, Imperial, Jazz Duets, Ken McKintyre, Paul Quinichette, Ted Brown, Warne Marsh by LondonJazzCollector. Bookmark the permalink. Thanks again, LJC, for the superb jazz. You’re impeccable taste never fails to dig up nuggets of gold. Only released on DVD, this is so strange! As far as I know, Norman Granz hired the Miles Davis Quintet for Jazz At The Philharmonic (strange fact). For some reason, Davis refused to play, maybe because of Oscar Peterson (now that makes sense), so the group became the John Coltrane Quartet, with Wynton Kelly, Paul Chambers and Jimmy Cobb. Granz loved jam sessions, and that became a JATP tradition, so he added Stan Getz and then Oscar Peterson to the band. Enjoy it! I also remenber a video that is no longer on the web of Wayne Shorter playing blues with Scott Hamilton, and the bass player was Gary Willis, from the fusion band Tribal Tech. interesting duet between Getz and Trane. Thank you for sharing what were at the time extremes on their instrument. On disc there is Trane and the Vice-Pres, also two opposing tenor world views (Prestige – Cattin’). The JATP circus organized by Norman Granz used to travel with the M.D. Quintet. So, typically a concert would feature the JATP guys before the break and M.D. for the second part. Many names, but not much value for money. CD’s exist of these concerts taped in Scandinavia. Interesting…that UK pressing of the McIntyre/Dolphy LP. I have been after the New Jazz original for a while but will keep an eye open for the Esquire version now though I dont expect it goes for much less. I’m intrigued by “The Chase Is On” both for the players and the fact that it’s on Parlophone. I don’t recall ever seeing a jazz title on that label before, although I’m sure that has a lot to do with residing in the States rather than the UK. Parlophone was a British label from the EMI stable, better known for releases byThe Beatles. For some reason they issued a number of jazz titles under license from Bethlehem, including my copies of Howard McGhee Dusty Blue and Mingus’ East Coasting. They tend to be somewhat rare and pretty good pressings. Yah, I’m familiar with Parlophone as a UK label due to a life long obsession with the Beatles, I have just never come across a jazz title (that I can remember) in 20+ years of digging through the record racks. So vVERY rare on this side of the pond I would say!! Of course the one double alto sax record which will be sure to appeal to.. er… almost everyone is John Zorn’s pairing with Tim Berne to play the music of Ornette Coleman on Spy Vs Spy. It’s very much unjustly branded as an unrelenting assault on the eardrums. Well most of side one probably is, but side two has more reflective moments. Worth having the vinyl for the artwork alone which makes for one of my favourite ever album covers. Andy, I used to have this and as you say it is an unjustly maligned record. I have read it described as jazz-metal, and in some respects it’s not a bad description. You can always trust Zorn to try something contrary. I didn’t keep it because after a while I found the drumming relentless and lacking in subtlety. I also — as I recall and confirmed from the clip you posted — hated the sound of the drums. With a different drummer and different drum sound it would have been a better record. You’re right, although I’ve heard Joey Baron in other contexts I think he’s a decent drummer with his own style. The problem is having two. Is there ever a reason to have two drummers? A percussionist may be but two never works for me. All you need is two drummers with one brain, like Art Blakey, Max Roach or Steve McCall. One of the rare examples of two drummers having successfully co-existed in an ensemble was the Kenny Clarke – Francy Boland Big Band, with Kenny Clare initially substituting for Clarke when the latter was unavailable but becoming a regular in what became a two-drummer band. I was lucky enough to see them in concert around 1968, and I found their mutual respect and rapport quite amazing. I never quite understood why there had to be two drummers, because Clarke was still in his prime and he was the epitome of a perfect, professional musician. But the results on record are so compelling that any questions of that kind seem redundant. Andy, Good point: two drummers. I had forgotten. Never a good idea. I thought this was about actual duets — not two sax line-ups. I’ve been discovering duet playing over recent years and often find it fascinating. While driven largely by economic considerations, I imagine — it’s cheaper with just two paying — real duets are sometimes not just gems in themselves but where a sax player’s real artistry shines. I’ve just acquired a couple of Konitz’s duet dates — Wild As Springtime, with Harold Danko (1984) and another I can’t remember the details of — and I would certainly buy more. I shall have to have a look and see what other duet recordings I’ve got. FAST MOOD, with Martial Solal and Michel Portal is terrific, and I would very much like to get more of Solal’s duet recordings. But there’s lots of duet recordings out there to experiment with — and if you can find them in whatever format they seem almost invariably cheap. The first jazz blog to be peer reviewed. Sorry — it sounded picky and wasn’t meant to be. I don’t know what I would call them, personally… Two sax line-ups, I suppose, seems more accurate. I was also thinking about what kind of duos seem plausible (sax and piano, obviously; piano and almost anything) and what don’t (two brass instruments?). Hey — just like the scientific journals. Who’d a thunk it? The other record may have been “The Lee Konitz Duets” (Milestone 9013), with Joe Henderson and a couple of other duet partners on different tracks. No, I’ve just remembered — it was Lee K and Hal Galper, anLP called WINDOWS on Steeplechase (1977). I love the The Chase is On. The originals look very expensive. Which re-pressing would you recommend? Has anyone heard the Japanese (Prestige/Victor) pressing 1977? I don’t have the Victor in question but I have a handful of other Victor pressings and they fall in the vintage King/Toshiba mould. More restrained than original Prestige or in this case Bethlehem, but quite acceptable, and great value for money. transitions from one instrument to the other sound seamless, so that you cannot tell right away who is playing. Let’s not forget the great albums made by Johnny Griffin & Eddie “Lockjaw” Davis, including “The Tenor Scene,” “Griff and Lock,” “Blues s Up and Down” and “Tough Tenors.” They’re all truly great records. And there are a few Sonny Stitt and Lockjaw, including “Tenor Battles” and “The Matadores Meet the Bulls, ” which are also great. And “Boss Tenors” by Gene Ammons and Sonny Stitt which is a personal fave. Gene Ammons also did a nice session with Dexter Gordon. One of my favorites. 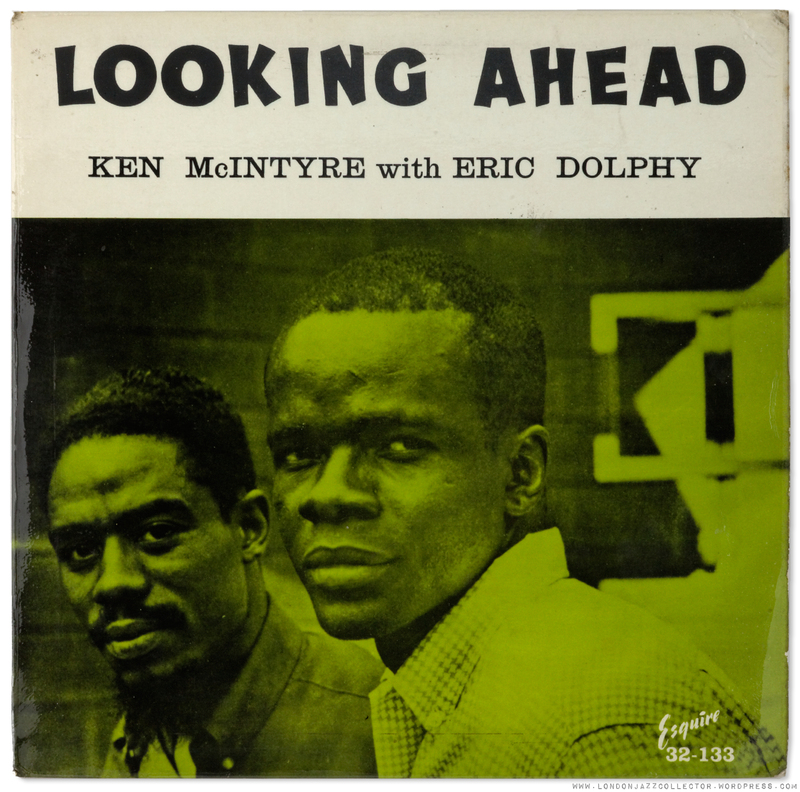 It just so happens I have been on an Eric Dolphy binge lately and decided to listen to the entire Mckintyre and Dolphy “Looking Ahead” LP. Thanks for the introduction LJC, I did not know about this one yet. It seems to me that Eric could break the bounds of traditional jazz improvisation any time he wanted to. And that was often. It does not seem that most of his peers could keep up with him in this regard. Maybe they did not want to, or were afraid to. The critics were not kind to him. I listen to Eric when I am bored with hard bop and cool jazz. He wakes up the mind; even that bass clarinet. I’m a huge Dolphy fan in general, but I probably prefer his bass clarinet playing-here, or on the New Jazz albums, or with Ornette Or Chico-most of all. Will have to take a listen to the Ornette and Chico LPs. Don’t have those in my collection, yet. Picked up Dolphy Berlin Concerts and Dolphy and Booker Little memorial album yesterday at the local record store. And my reference to his bass clarinet was made with affection. I recently played “Tenors Head-On”,Bill Perkins/ Richie Kamuca on Liberty LRP 3051.The atmosphere is very strong LesterYoung. Two phenomenal tenors! By sheerest coincidence, I just this afternoon picked up the sister French Blue Note one-fer of Bill Perkins with Ritchie Kamuca. Look forward to digging into this tonight! 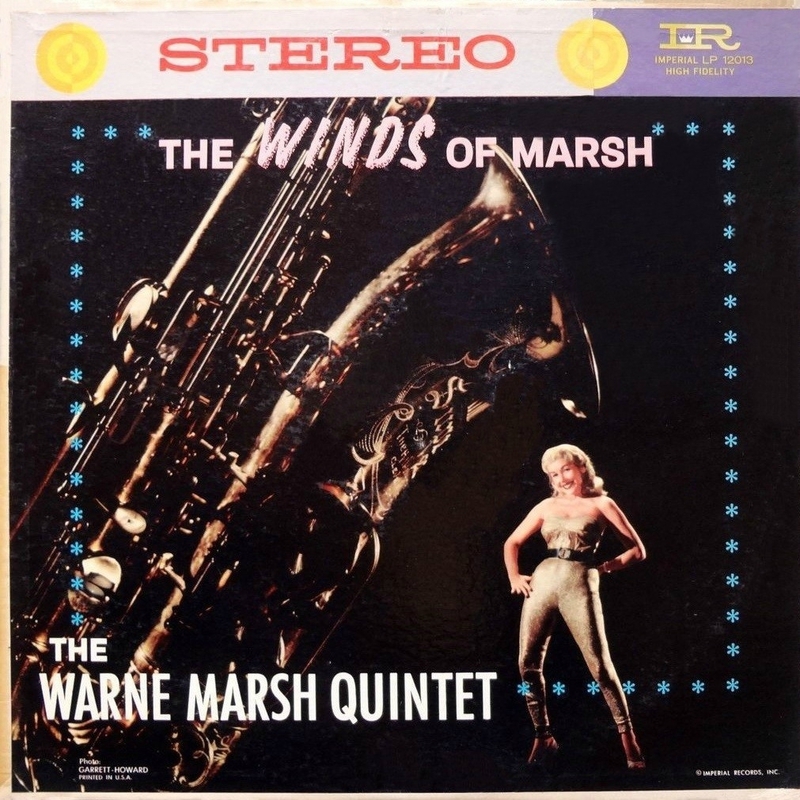 warne marsh is an avant garde giant? hahahahahahahahahahaha. sorry, that was coarse of me. He was, in his time. Duh, I know of them, but I don’t own any, for the purpose of ripping. (Sometimes the cart comes before the horse, for such piddling practical reasons – lifts head from shame). But thanks for mentioning them. 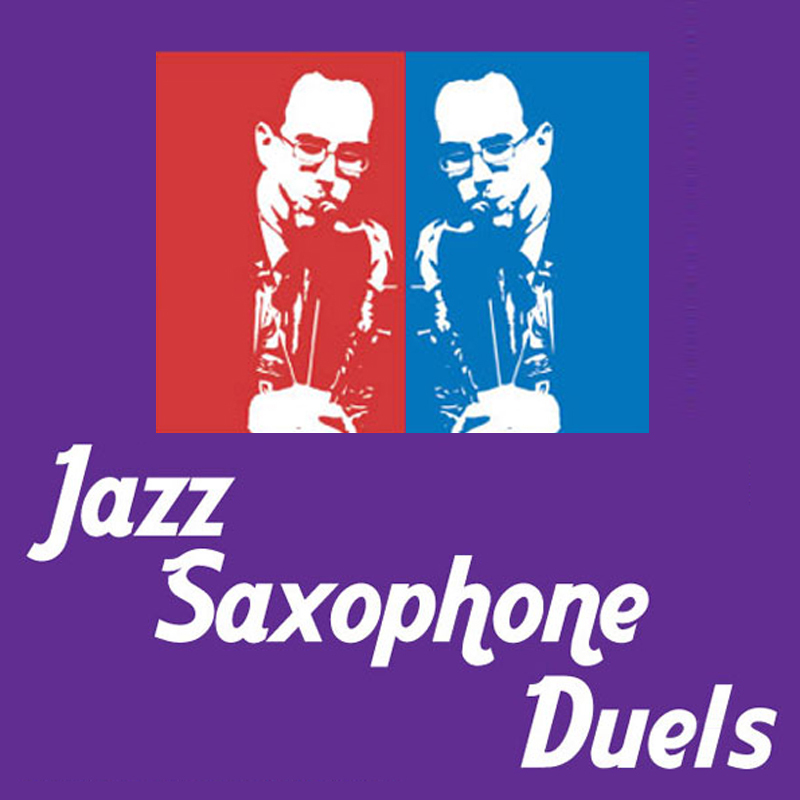 I got some great duels – Sonny Rollins vs Sonny Stitt that leave you absolutely breathless. Something for another day, definitely. Yes – Sonny Side Up! there are also the numerous Griffin and E.L. Davis albums on Prestige and Jazzland, very boring in the end. But I thought the idea of this post was not to catalogue all ten/ten or alto/alto outings which have been put on wax. Marsh: this is one of my favorite records. if you just add to this line-up Art Pepper, you have a three tenor masterwork, Free Wheeling on Vanguard. 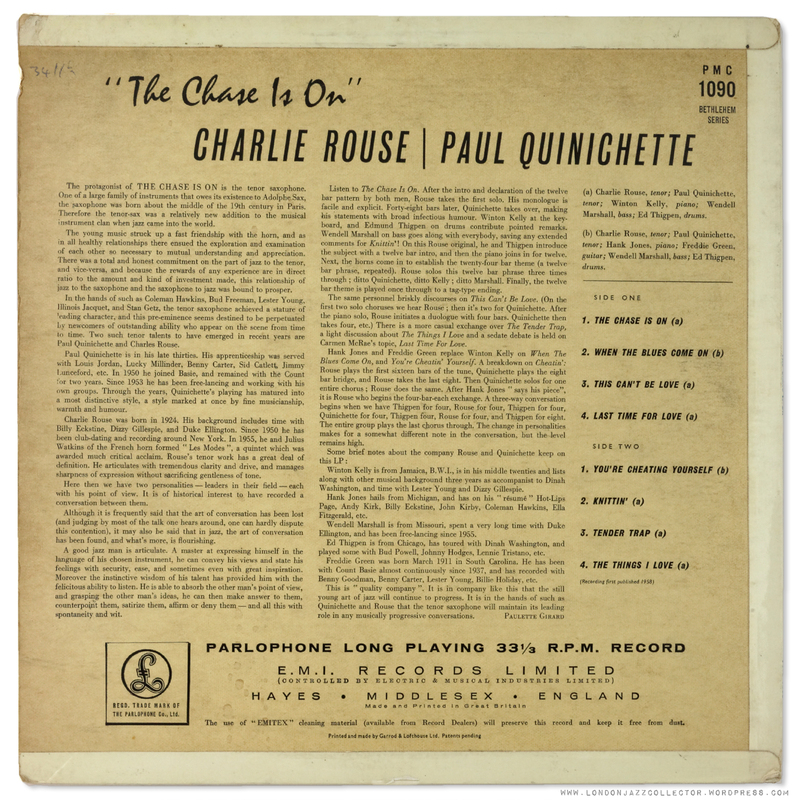 Rouse and Quinichette: while one of my preferred tenor voices is Pres, here Charlie wins ko. McKintyre and Dolphy: no competition, Eric is among Gods, Ken has both feet on the ground. There is an extra spring in Dolphy’s step, that’s for sure. 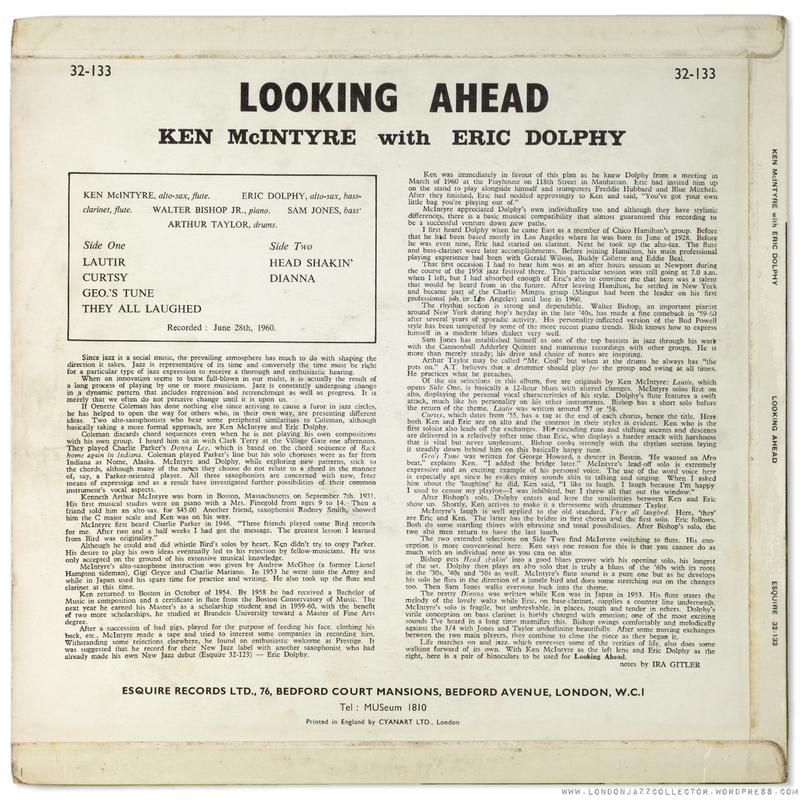 Though some of the material on the Looking Ahead album is a little uneven, a little more flute than I would have wanted, Dolphy’s alto is positively on fire, perhaps spurred on by the presence of Mckintyre – a little friendly competition never does any harm. Dixie’s Dilemma on Jazz of Two Cities…..serious piece of two-tenor jazz that! Talking of two tenors……Ronnie and Tubbs’ The Couriers of Jazz (Carlton) always gets my vote….but then you knew that already!